Many people assume that the term ‘green cars’ refers only to electric vehicles but this is not the case. There are actually a few different types of green cars that work in different ways in order to reduce the reliance on fossil fuels. Below is a guide to the different types of green vehicles that are currently on the market to help you choose a green car. Click on the title for each vehicle type for more detailed information. A plug-in hybrid car combines a regular petrol or diesel engine with a battery-powered electric motor. As the name suggests, plug-in hybrid cars can be plugged into mains in order to provide longer electric-only journeys. Plug-in hybrid cars are perfect for driving in urban settings since they enable you to drive on electric power only for up to 30 miles, helping to drastically reduce emissions and help you save money in fuel consumption. Another big benefit of plug-in hybrid cars is that they’re exempt from tax due to their low emissions. A hybrid car also has a petrol or diesel engine as well as a battery-powered electric motor. 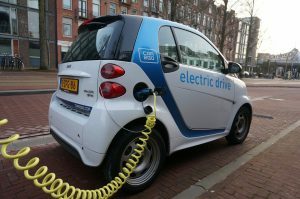 Unlike a plug-in hybrid, a hybrid car’s electric motor cannot be charged at the mains; instead it is charged by energy that’s captured when the vehicle brakes, or sometimes from the engine. Hybrid cars are another type of vehicle that are great for driving in urban areas. This is because they can run on electric power only for a good distance and when the vehicle is at a standstill, the engine is switched off, helping to cut down emissions and fuel consumption. Hybrid cars are considered a very economical choice, which is why a growing number of companies are now investing in hybrid cars. An electric car is the lowest emission car type that you can get. Unlike hybrids and plug-in hybrids, an electric car is powered purely by an electric motor. This means there are zero fuel emissions, making it a perfect environmental car. As well as the money you save in fuel costs and positive effect that driving an electric car has on the environment, they are also very enjoyable to drive. They’re extremely quiet and provide a smooth driving experience that many people find to be preferable to a petrol or diesel car. Clean Green Cars are now offering an insurance comparison service that enables you to easily compare quotes from some of the UK’s leading insurance providers. What are you waiting for – compare and save today!